Back in 1970, during my first year as a New York City resident, my roommate and I brought dates to this place on East 54th Street. 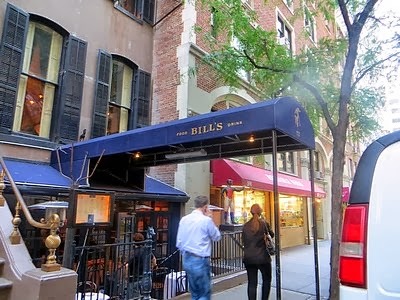 At the time it was named Bill's Gay Nineties and, as the name implied, it was a pitchers of beer, peanut shells on the floor kind of place with a guy in a straw boater playing banjo and singing "Sidewalks of New York." Some years later I walked by and noticed that the name had been changed to "Bill's Nineties Bar," no doubt to avoid possible misidentification as a gay bar. A few days ago, I walked along the same block again and saw that the name is now simply "Bill's." I suppose the passage of time means that "Nineties" now opens the question: do we mean the era of Diamond Jim Brady and "Remember the Maine" or the more recent decade characterized by, as a friend put it: "lots of Backstreet Boys and body glitter"? It's 1967 again...at least in baseball. Red Sox vs. Cardinals. From 1960, the year the "Beat 'em Bucs" Pirates took the measure of the big, bad Yanks, until 1967, I didn't pay much attention to baseball. I was amused by the '62 Mets (and never thought that someday I'd be a fan), and had a flutter of interest in the '65 Minnesota Twins and Harmon Killebrew. When I arrived in Cambridge for law school in September of 1967, I was quickly made aware that the local team was on a roll. When they won the pennant, things went wild. "Owah Sahx ah th' greatest!" a townie kid cutting across the Yard on his way home from school yelled as he passed me. "They'ah gonna beat those Cahd-nuls." So I started paying attention to the sports news and learned about Lonborg and Yaz and Scott and Rico and the tragic injury to Tony C.--I found out that my then girlfriend, who lived in Richmond, Virginia, had a crush on him--that would keep him out of the World Series lineup. I heard "The Impossible Dream" on the radio a hundred times. The dream would prove impossible. It took seven games, but the Cards beat the team that had last appeared in a Series the year I was born (1946) and last won one two years after my mother was born (1918). By 1986 I had become a Mets fan--a logical extension of my first baseball love, which was for the Brooklyn Dodgers--and so celebrated the Sox loss of that Series, though with just a hint of wistfulness. 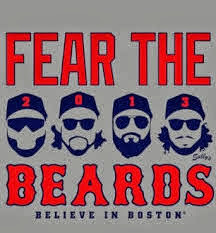 This year I'm rooting for a reversal of 1967, in part because my wife is a Sox fan, but since I've long had a soft spot for the Cards on purely aesthetic grounds, I hope it goes to seven games again. Addendum: Archaeopteryx reminds me that 2004, the year the "curse" on the Sox was lifted, was also a replay of '67, Sox vs. Cards, though it was won by the Sox in a four game sweep. Because of my father's illness (he died the night the Sox won game four) I didn't pay much attention to that Series. Also, Richard B points out that the '46 Series also featured the Cards against the Sox. It was, like '67, a seven game battle won by the Cards, and featured two of the past century's greatest players: Stan Musial (Cards) and Ted Williams (Sox).